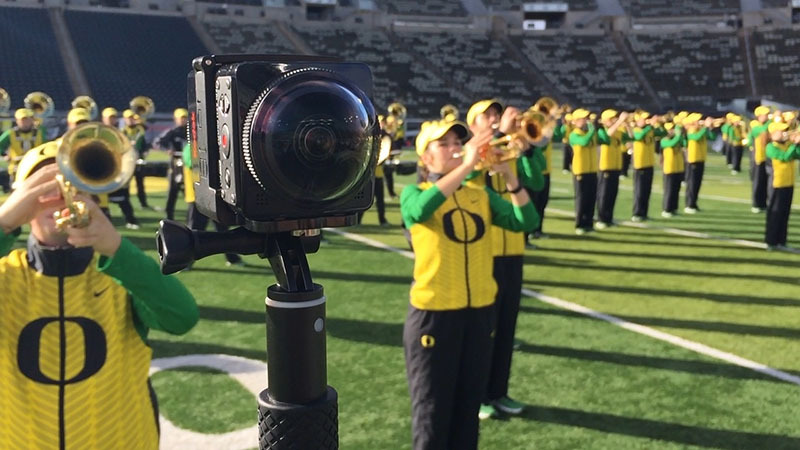 For anyone who’s ever wondered what it would be like to perform with the Oregon Marching Band in front of a packed crowd at Autzen Stadium, a new series of 360-degree “virtual reality” videos are about as close as it comes to the real thing. The School of Music and Dance has produced highlights from several home games over the last football season using the immersive new medium. They include: a rousing rendition of the school’s fight song “Mighty Oregon”; a complete halftime show featuring a medley of Jimi Hendrix’ greatest hits; a powerful performance of the national anthem with a flyover from a trained bald eagle; dance routines and aerial stunts from the Oregon Cheerleaders; and scenes of the marching band providing its unique brand of musical motivation from the stands, along with a special guest appearance from The Duck. The videos were captured using two wide-angle cameras, each simultaneously recording at four times the resolution of high-definition television. These huge video files were then stitched together with advanced editing software to create interactive videos that let viewers choose exactly where they want to look, in real time, around a seamless 360-degree scene. “They’re seeing a whole new perspective that you don’t get unless you’re actually marching in the band,” said Gabby Socolofsky, a flute-playing freshman from Lake Oswego. The view can be controlled simply by moving a smartphone with the latest version of the YouTube app. On a desktop computer, the perspective can be changed with the mouse or by using the “a,” “s,” “d” and “w” keys on the keyboard. Band member Kylee Striplin, a social science and popular music major who plays flute and trombone, said she was excited to share the videos with friends and family who often have trouble picking her out of the crowd on game day. “With this close-up view, I can tell them which yard line I’m on and they can turn the camera and see me,” Striplin said. Director of Athletic Bands Eric Wiltshire said the 360-degree videos gave him an even better view of the marching band’s halftime show than the prime position he’s occupied on the sidelines near the 50-yard line for the past 11 seasons. Wiltshire said he hoped the videos would inspire the next generation of Oregon Marching Band members. “If they’re high school students who want to be in the band, I hope they can see people who are like them having a great time and see a place for themselves in the group,” he said. Brad Foley, dean of the School of Music and Dance, said he was looking forward to using the technology to share student and faculty performances with people who can’t attend live events in person.